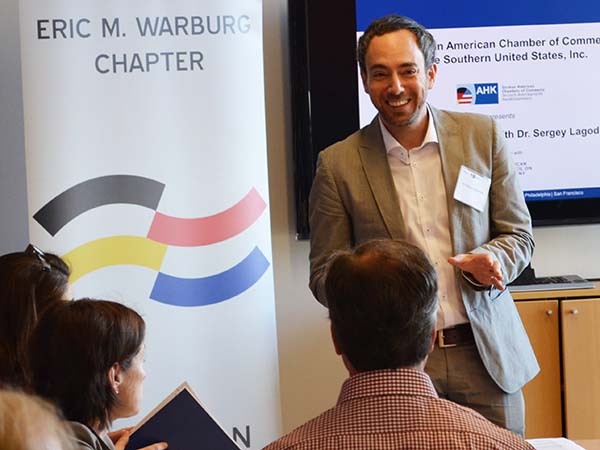 Our Atlanta Warburg Chapter works in close partnership with organizations such as the German American Chamber of Commerce of the Southern US, Inc. (GACC South), the Goethe Zentrum, the German Consulate, and various local organizations and universities. Together with its partners, the Chapter has hosted several events in 2017, including discussions with Jan Kallmorgen, Partner and Head of Investor Advisory at Interel; Dr. Cornelia Schu, Managing Director and Director of the Research Unit and Expert Council German Foundations on Integration and Migration (SVR); Eckart Woertz, Ph.D., Senior Research Fellow at the Barcelona Centre for International Affairs (CIDOB) and Scientific Advisor to the Kuwait Chair, Sciences Po in Paris; and Prof. Dr. Michael Haspel, Director of the Evangelischen Akadamie Thüringen and Professor for Systematic Theology at the Friedrich-Schiller-Universität in Jena. Topics have ranged from geopolitical challenges, labor migration and the refugee influx, as well as the economic longevity of ISIS and general discussions on the importance of the German-American partnership. Martina Stellmaszek is an experienced Executive with a demonstrated history of working in the international trade and development industry. She has a high-level network in the corporate, political, and academic arena. Most recently, Martina served as President & CEO for the German American Chamber of Commerce of the Southern US (GACC South). The GACC South is the official representation of German industry and trade in the Southern US. Its mission is to further, promote, and assist in the expansion of bilateral trade. The organization combines elements of a trade commission, a membership association, and a professional consultancy. Martina is originally from Munich, Germany. She has a double-degree in Business Administration from the European School of Business in Reutlingen, Germany and the Universidad Pontificia Comillas in Madrid, Spain and earned her MBA from Emory University in Atlanta, Georgia. She currently resides in Atlanta with her husband and three children.